Shopaholic takes Manhattan is one of my fave books! I mean it's just so good. I am so glad that you've finally dig it! you know where Bookay-Ukay is? i have seen one malapit dito samn, sa Teacher's Village, marame bang branch un? I read that book of Coelho. Too many lessons and thoughts for one's soul. Try The Alchemist. It's a superb book. Yay,books! I haven't red one for what seems like a long time. :( I'd love to collect Pugad Baboy. hahaha! You can do more naman. :D Go lang! I am so jealous! I want to horde some books as well! 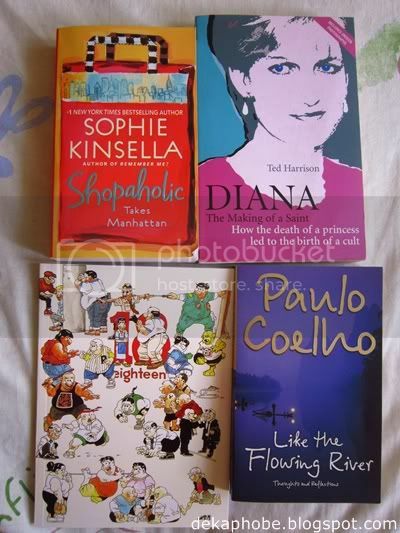 :P I want that Paulo Coelho book!